The brief for this Zesta Kitchens client was to work around a tight area to create a kitchen that maximised the space leading to the neighbouring dining room. Enter Mary Maksemos, Designer from our Richmond showroom who designed a workable yet beautiful kitchen for this Balaclava family home. With space being tight it was also important to build as much storage as possible while creating a kitchen that looked and felt luxurious. The colour and type of materials used was key. Both helped create an open bright environment consistent with the older style of the home. 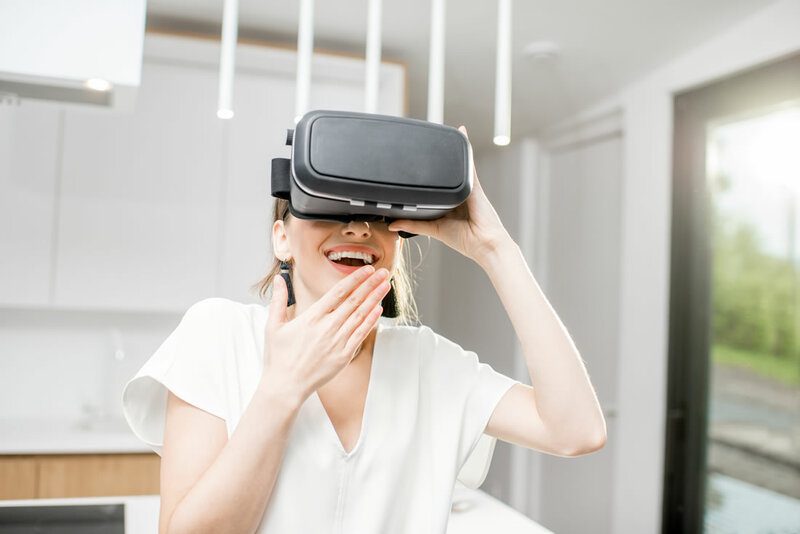 Mary set to create a wow design using our world-class 3D Design software, making it easy for the client to visualise what their kitchen would look like in real life. This is a key to our successful kitchen design process. Client’s are thrilled to see the final result before the kitchen is made. They also love to see how it meets everyone’s needs. As you can see the kitchen is now bright, open and so inviting for family and friends. The angled benchtop design meets the brief by cleverly helping to maximise the space and improve the flow in the kitchen. Light from the adjoining window and neighbouring dining space pours in creating an abundance of natural light. With storage being key, the Designer has created an array of drawers, cabinets, and pantry to store all essential kitchen items. 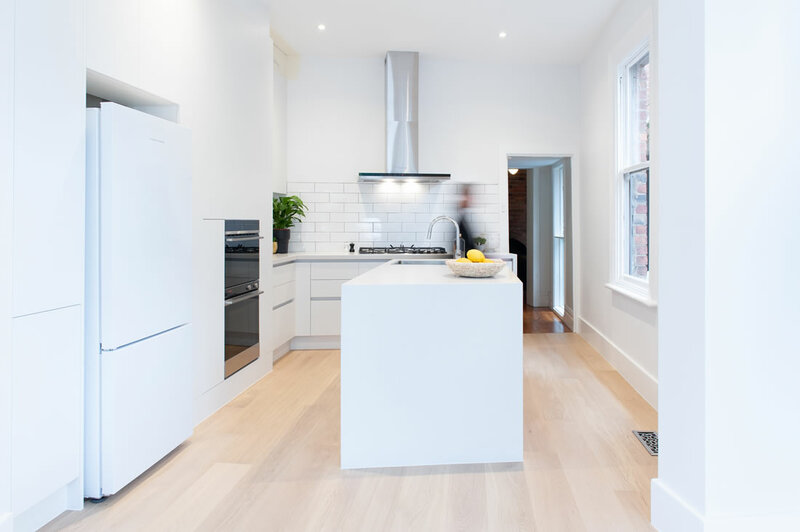 The Qualia white matte cabinetry not only opens the space, but it also makes it feel light and bright. This is further enhanced by the Caesarstone Fresh concrete benchtops. The wooden flooring adds warmth to space. By using handle free cabinetry the flow is seamless. 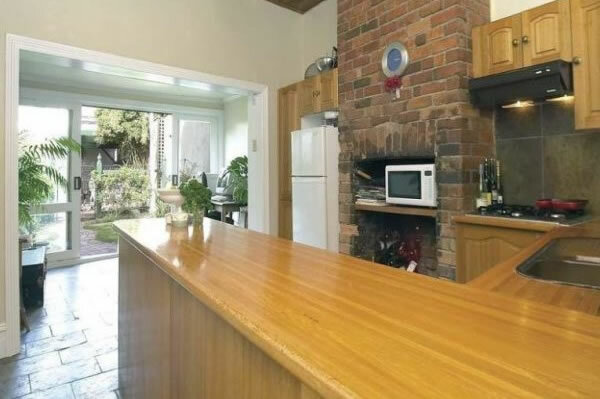 There has been a lot of thought and design in this Balaclava kitchen. The standalone kitchen island bench is the perfect space for preparing meals. It’s inviting for friends and family who can now move freely around and through the kitchen-dining space. Using stone such as the island bench ensures resistance to any passing traffic. Integrating the ovens into the cabinetry helps keep the kitchen streamlined and ties the space together beautifully. 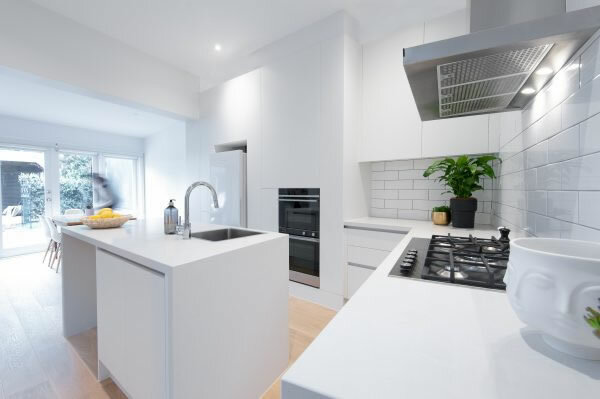 The addition of the white subway tiles and the new Clipsal power points in white completes the kitchen perfectly. As you can see from the before and after, our client was in raptures with the final kitchen renovation. She also commented on how much fun it was working with Mary. Mary, being true to form loves having fun with clients. She finds this makes the design process easier and more relaxed in what can be a daunting time. They enjoyed having the trades in their home and were thrilled with how they cleaned up after the job was completed. This Balaclava renovation is now a delightful space – functional yet elegant. The process from showroom visit to in-home design consultation, manufacturing, delivery, installation and trades was straight forward, with the client commenting on how easy and on-time the process was. This beautiful space can now be enjoyed with family and friends. 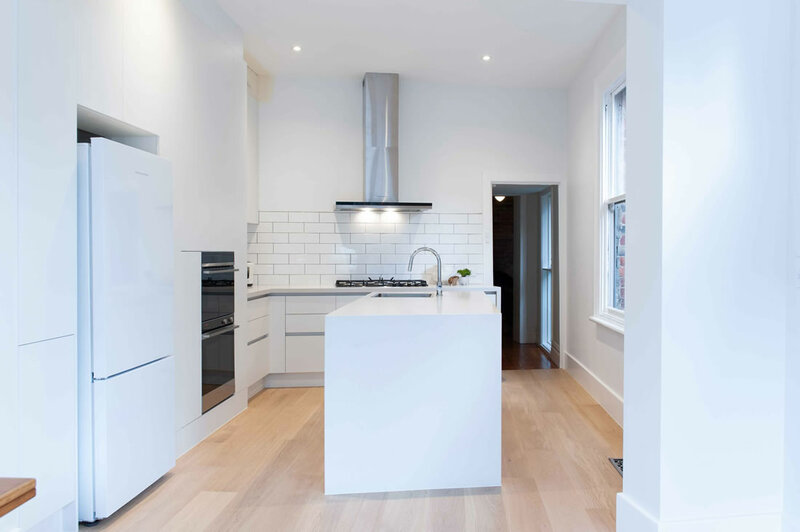 For other renovations view our Cheltenham Kitchen Renovation or for another stunning design this beautiful Middle Park Family Home Renovation.